President Recep Tayyip Erdoğan has become an increasingly pugnacious adversary of the United States. Turkey, along with the American-Turkish relationship, is going so far off the rails so quickly right now that there's no chance you're aware of everything that's going on unless you track it professionally or get Google Alerts in your inbox. Where to even begin? We could start, I suppose, with the fact that a Turkish court sentenced a Wall Street Journal reporter to two years in prison in absentia for "promoting a terrorist organization." Her real crime? Interviewing and quoting members of the Kurdistan Worker's Party (PKK). In other words, doing her job. The reporter, Ayla Albayrak, is in the United States now, so President Recep Tayyip Erdoğan can't get his grubby mitts on her, but let this be a lesson to all journalists who write about Turkey. You can and will be sentenced to prison. Whether or not you're a journalist, Americans can be sentenced to prison just for existing in Turkey. Conspiracy theorists who manage to bend a state to their will are capable of extraordinary destruction. Lest you believe these people might actually be guilty of something, consider this: A NASA scientist is also currently jailed there. The authorities arrested him while he was visiting on vacation. The evidence against him? Having an account at a bank supposedly "linked" to Gülen, whatever the hell that's supposed to mean, and for having a one-dollar bill in his pocket, which is supposedly how Gülenists identify themselves to each other. 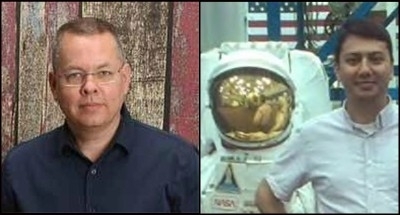 Two Americans jailed by Turkey on trumped up terrorism charges: pastor Andrew Brunson (left) and NASA scientist Serkan Golge. If you've ever seriously wondered if political leaders who wallow in conspiracy theories are dangerous or simply exasperating, look no farther than Erdoğan. Conspiracy theorists who manage to bend a state to their will are capable of inflicting extraordinary amounts of destruction on a virtually limitless number of people. I have reported from police states in the past. I risked deportation for doing so, not imprisonment, even in communist countries. When it comes to the treatment of journalists, the Turkish government is more oppressive even than China's or Cuba's. Turkey has in fact jailed more journalists than any other country in the entire world. Erdoğan says they're all terrorists. Probably none of them are. Being branded a terrorist in Turkey is only faintly more plausible than being fingered a witch in Salem, Massachusetts, 300 years ago. On the off chance that you aren't quite convinced, the director of Amnesty International in Turkey is also facing 15 years in prison on terrorism charges. Meanwhile, an employee at the US Consulate in Istanbul was arrested for "facilitating the escape" of some "Gülenists." The United States government responded by refusing to issue non-immigrant visas to anybody from Turkey, and the Turkish government responded in kind. So if you're an American planning on visiting Turkey any time soon on business or as a tourist, sorry. You can't. Under current conditions, you probably shouldn't go anyway. Turkey is holding a number of Americans hostage and isn't shy about admitting that they are hostages. "Give us the pastor back," Erdoğan himself said last month. "You have one pastor as well. Give him (Gülen) to us. Then we will try him (Brunson) and give him to you...The (pastor) we have is on trial. Yours is not - he is living in Pennsylvania. You can give him easily. You can give him right away." Taking hostages is an act of war. It's what Iran, North Korea, and Hezbollah do. Needless to say, this is not how a NATO ally is supposed to behave. Taking hostages is an act of war. It's what Iran does. It's what North Korea does. It's what Hezbollah does. It is not what genuine allies like the United Kingdom, France, Canada and Germany do. 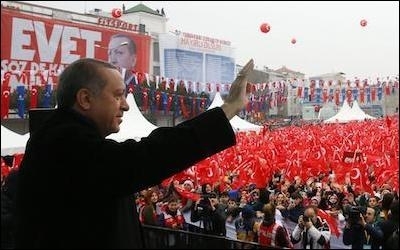 Erdoğan is not going to settle down if the United States doesn't deport Gülen, which Washington refuses to do as there is scant evidence that the exile had anything to do with last year's coup attempt and reams of evidence that the old man couldn't possibly get a fair trial if he were shipped back to Ankara even with the best lawyers on earth. Erdoğan probably won't settle down even if he does manage to throw Gülen into a dungeon or onto the executioner's chopping block. Stalin didn't settle down after one of his goons dispatched his rival Leon Trotsky with an ice axe in Mexico City, nor did the Ayatollah Khomeini settle down after the Shah Reza Pahlavi died from cancer in the United States in 1980. Authoritarian conspiracy theorists are never sated. They can only be resisted until they are overthrown or in the ground. Turkey is still in NATO. We'll see if that lasts much longer.